Greetings all. My wife is the blogger for the site, but she wanted me to to an entry talking about emergency communications. When trouble strikes, after you have your family safe, and food and water are available, then the next issue is finding out what is going on. Cell phones are a good place to start. Most people today have a phone of one sort or another. One thing to note is that by federal law in the US, every modern digital cell phone has access to 911 service, even without a carrier. I know several people who keep old cell phones with a car charger for it in their 72 hour kits or their cars. You do not have to pay a monthly fee to be able to use it. Without a carrier service, all it can call is 911, but if you are stuck somewhere and need help, 911 is likely all you need. Most people will have an old cell phone laying around their house from when they last upgraded. You can also find cheap old cell phones in places like Goodwill or the Salvation Army. Car chargers are cheap. You can usually find them for $15 or less new. Most people will simply say that they have their cell and that is enough, right? Not always. Don’t get me wrong. Cell phones are great, but they do have limits as to what they can do. You have to have service, you have to a service provider, and cell phones are dependent on the cell network. If that network goes down, loses power, or get overloaded, then your phone is useless. Additionally, cell phone networks can go down in large emergencies due to being overloaded with calls. Sometimes they will be shutdown intentionally for public safety reasons. Planning for emergencies all about having backup plans. So what do you do if the cell phone doesn’t work? Emergency communications comes in 2 parts. Receiving and transmitting or in other works, getting information in and then getting out. Most important is being able to find out what is going on. This includes things like road closures, or where shelters or evacuation centers are. First place to go is the radio. Since almost every car on the road as an AM/FM radio, you have a good place to start already. AM radio typically has more news and information programming, and due to the nature of AM radio, it can be heard a long way from where the transmitter is. FM tends to be more popular and is easier to find local stations. One of the best sources of information is NOAA Weather Radio. In the US, there are 7 frequencies that are managed by the National Weather Service. They are all FM stations at 162.400, 162.425, 162.450, 162.475, 162.500, 162.525, and 162.550 MHz. There a usually one or two stations in any given area of the country. Weather Radio operates 24 hours a day, seven days a week. It is an invaluable source of information. Normally they will broadcast regional weather observations and forecasts. So you can tune in any time and find out the weather for your area. One really nice feature is that they will broadcast alerts of hazardous weather in their area. In addition, they will broadcast non-weather related information in the event of emergencies, natural disasters, and terrorist attacks. They even broadcast local AMBER Alerts. Because they are run by the federal government, there are no commercials. To any readers up north, Canada operates Weather Radio Canada, which is very similar to the US system, and they even use the same frequencies so weather radios will operate in both the US and Canada without a problem. Bermuda operates their own weather radio service that transmits on 162.550 MHz as well. Unfortunately, most cars do not have the ability to receive Weather Radio channels. So you will probably need a separate radio. 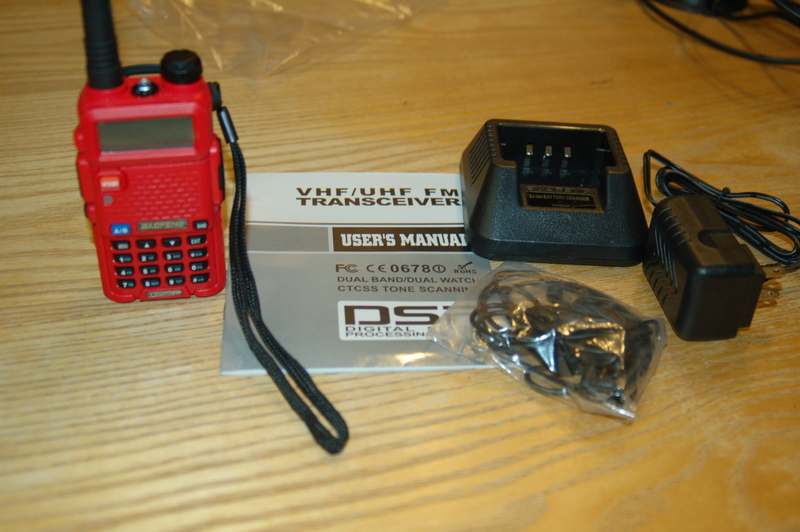 They make emergency radios that have AM, FM and Weather Radio tuners. These include multiple options to power them. They commonly have solar cells, hand cranks, wall adapters, and the ability to run off of batteries. Many of the newer ones even include the ability to use them to charge small USB devices like a cell phone and have built in lights. 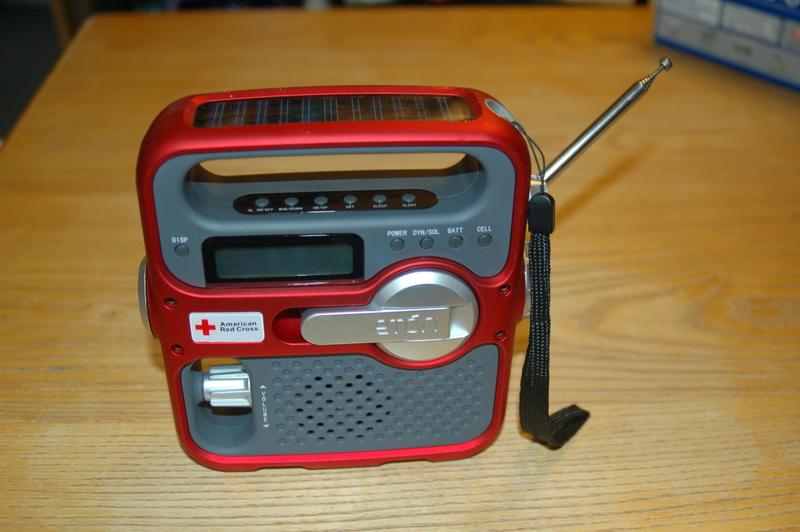 You can find these radios at amazon.com, redcrossstore.org, or at your local Radio Shack. Target and Walmart sometimes carry these in store. These emergency radios start at around $30. There are also home weather radios that can turn themselves on automatically in the event of a hazardous weather alert and will display information on the alert. These home stations start around $50. These can be very useful for people living in areas prone to severe weather. Shortwave radio is radio that is transmitted on lower frequencies usually 1.7 to 30 MHz. Due to the way that these frequencies can be reflected off the earth’s atmosphere, these signals can travel for thousands of miles. Several companies and organizations operate radio stations that can be heard around the world. Ever want to listen to Radio Moscow or the BBC live from London? This is how it is done. Due to the way the signals propagate, they are great for long distances, but not that great for local communication. Shortwave is best for getting information from outside your local area. Shortwave radios are available online and at your local radio retailers. Prices usually start at $50, but you can find cheaper ones. The final concern with emergency communications is getting in touch with other people. There are several ways of doing so with varying degrees of effectiveness and price. The first option is FRS (Family Radio Service). 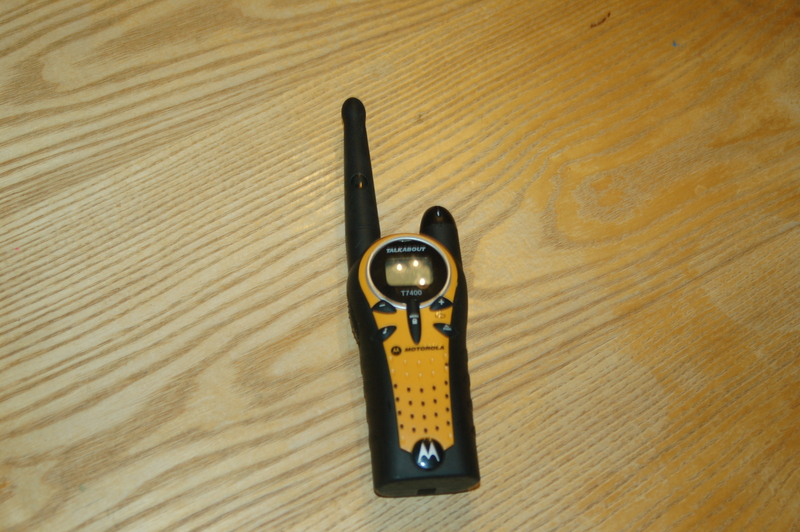 These are hand held walkie-talkie style radios. You can find these radios online, at Walmart, electronics stores like Best Buy, even many sporting goods stores carry them in a variety of styles with prices starting around $35 for a pair. FRS is not the most reliable system due to its limited range. Hand held ones are usually only good for communication up to a mile or two. Most FRS radios even include NOAA Weather Radio. One thing to be careful of is that most FRS radios also can transmit on GMRS (General Mobile Radio Service) frequencies. Some frequencies are shared by both FRS and GMRS, but some are limited to GMRS only. Read the manual for your radio to make sure you know what frequencies you are using. GMRS radio have better signal coverage than FRS because they are allowed to use better removable antennas and have a higher power limit. 1 to 5 watts is radios are the most common, but licenses to be able to use up to 50 watts of power are available. GMRS is commonly used by businesses. Repeaters to extend coverage are in many areas, buy many are privately owned and operated and require special settings on the radio to use. Talking on GMRS frequencies requires a license from the FCC. That license costs $85, is good for 5 years, and will cover you and your immediate family. One suggestion for people who want to have FRS radios in their 72-hour kit: consider the batteries that the radio needs and what batteries you want to keep in your kit. 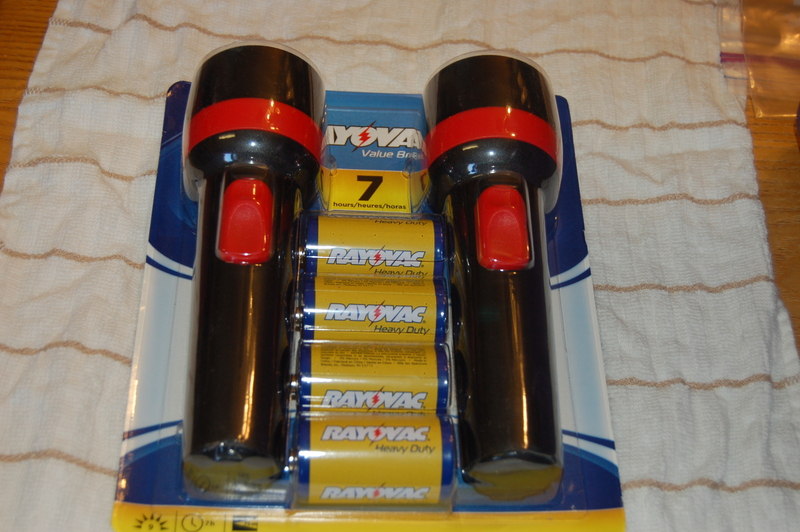 Some small radios use AAA batteries. If everything else in your kit runs off of AA’s, that can lead to a headache having to keep more battery types on hand. Look at what you keep in your kit, and then get the radio that take the batteries that you stock. Also be aware that the metal structure of a car will absorb radio signals. So a radio with its antenna inside the car will have much less range than a radio outside. FRS radios are required that the antenna be fixed to the unit, so they will perform poorly inside a car. The next option is a CB (Citizen’s Band) radio. CB radios have been around since the late 40’s and have long been associated with truckers. They are still widely used today. CB radios commonly go 5 miles, with 25 miles not being uncommon. CB channel #9 is reserved for emergencies and in many places is monitored by police. Using atmospheric skip to bounce the signal off the ionosphere, signal can go several hundred miles to thousands of miles, although clarity suffers greatly. CB radios come in both hand held and vehicle mounted versions. Vehicle mounted setups are the most common. They run of the car’s power and require an antenna mounted to the car. For a kit, you can get a radio that will run off a car’s cigarette lighter and an antenna that mounts to the car with a magnet. These mag-mount antennas can be rather long, ranging between 4 to 9 feet in length. Keep that in mind when you store it. Additionally, CB in many areas has a reputation as having a lot of people that have less than family friendly conversations, so be careful around your kids. Finally, there is Amateur (Ham) Radio. Ham radio requires that you take a test to get a license from the FCC. The license itself does not have a cost, but some areas will charge a small fee (up to $15) to take the test. License is good for 10 years and is free to renew. There are three levels of license: Technician, General, and Amateur Extra, each with additional operating privileges as you move up. Ham radio is a very broad topic. Most people think of guys in their basement talking to people in Europe. There certainly is a lot of that, but there are plenty more, like transmitting a form of TV, radio based e-mail, computer communication, community service groups, just to name a few. And no, you do not need to learn Morse code to get licensed, but it is still used quite a bit. To give you an idea about the difference between the various type of radio. By law, FRS radios are limited to ½ a watt. CB is limited to 4 watts. Ham radio operators can use as much as 1,500 watts of power under certain circumstances. Even low powered hand held and car mounted radios a can use repeater systems to extend their range. To keep it to emergency prep, the easiest radios to use are for the 144 and 440 MHz FM frequency bands, also known as 2 meters and 70 centimeters. Hand held radios can be had for less than $50 and car setups can be had starting around $300-400 for a dual band system, including antenna. 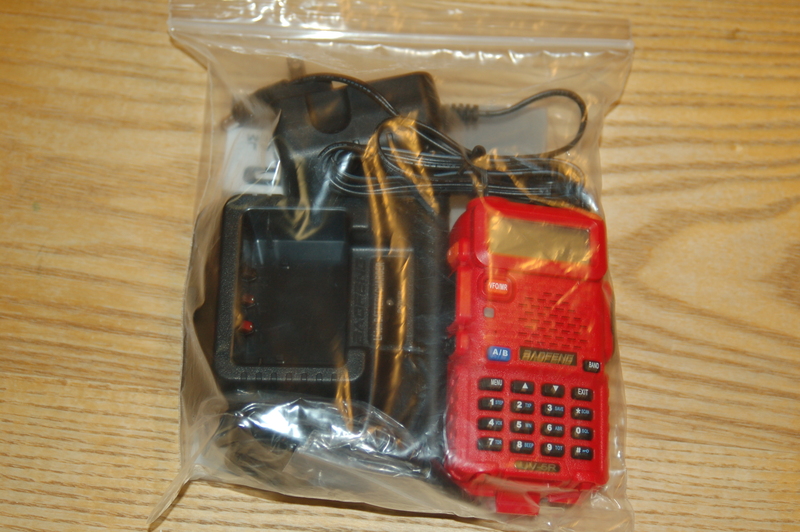 For our 72-hour kit, I have a hand held radio that I have programed for the local repeaters as well as the repeaters for several neighboring areas that we visit on a regular basis that I keep in our kit. I have car power adaptors and a mag mount antenna for my normal hand held ham radio. I plan on getting an additional car power adapter as well as a mag-mount antenna for the radio that I store in my 72 hour kit. One thing I will add on ham radio is that I do not recommend if your only interest is emergency communication. Due to the many options and technologies used, ham radio is something that takes regular practice to keep proficient on. 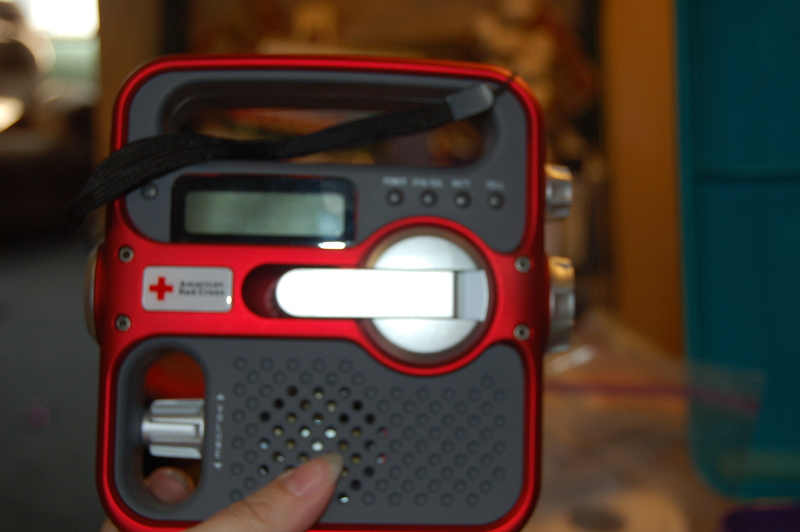 The last thing you want in an emergency is to pull out a radio that has been sitting on a shelf for several years and have no idea how set it up, what frequencies to use, who you need to talk to, or how to talk to them. If you are interested in radio theory and what you can do with them, by all means, get a ham radio license. I am just saying that if your only interest is emergency communications, then ham radio really isn’t for you. Communication should be part of any emergency plan and with emergency planning, the time to be trying to figure out how to use whatever method you have planned for is not when you need it. Plan ahead and know how to use your equipment and who to contact before you need it. Study the user’s manuals and practice with your equipment when it is calm so you are not trying to figure out how to use it in the middle of a crisis. Hopefully you will never have to use this, but it better to have the equipment and ability and not need it, than need it and not have it. I want to say thank you to everyone who participated in today’s self-sufficiency/frugal living class, sponsored by This Path Less Traveled, and cosponsored by Goodness Grows in Bedford, Pennsylvania. 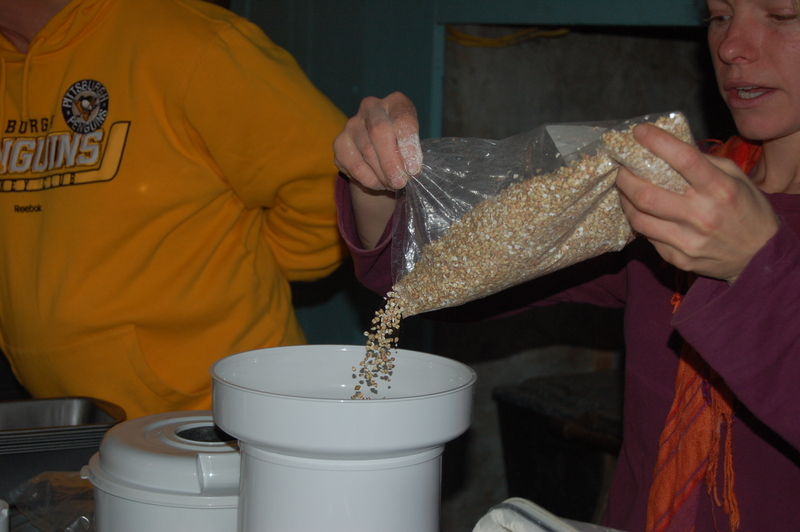 We had a wonderful time learning from Dawn Custer, owner of Goodness Grows, testing various types and models of grain mils, and playing with grains and styles of flour and cereals. 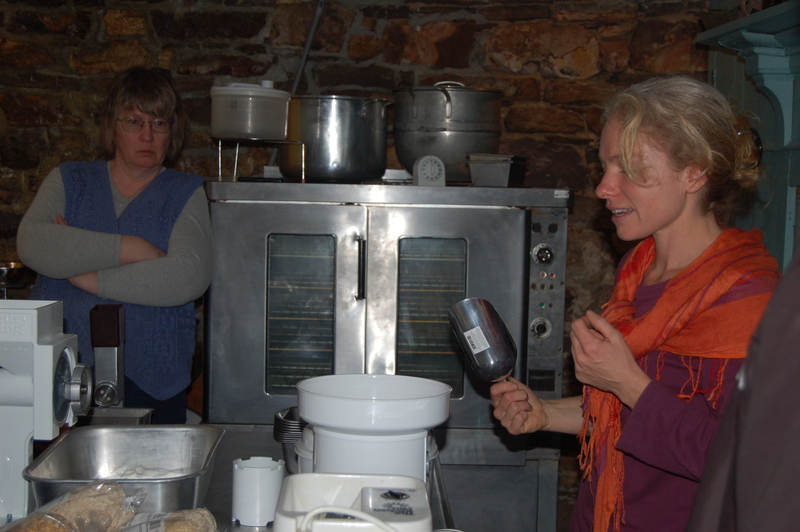 Plus, Dawn treated us to homemade bread, tea, and coffee from her traditional farm kitchen. I can’t thank everyone enough for supporting both of us today. If you were not able to attend, an online course will be posted within the next week. 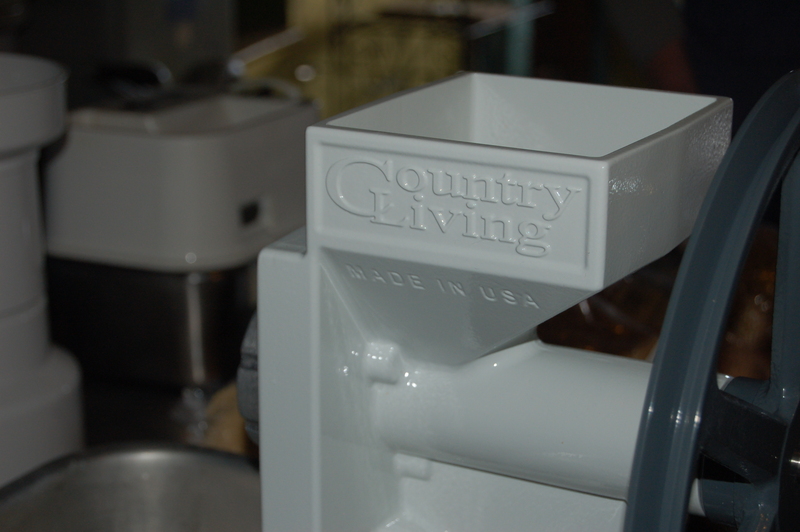 The online version of the class will be more technical–I will include write-ups on each of the mills we tried, what they can and cannot do, the group’s thoughts on each, a buyer’s guide (I will attempt to find the best price online for each mill), guide to various grains and uses for them, and a few other items. Until then, here are some teaser photos from our event today. Again, thank you to everyone involved! 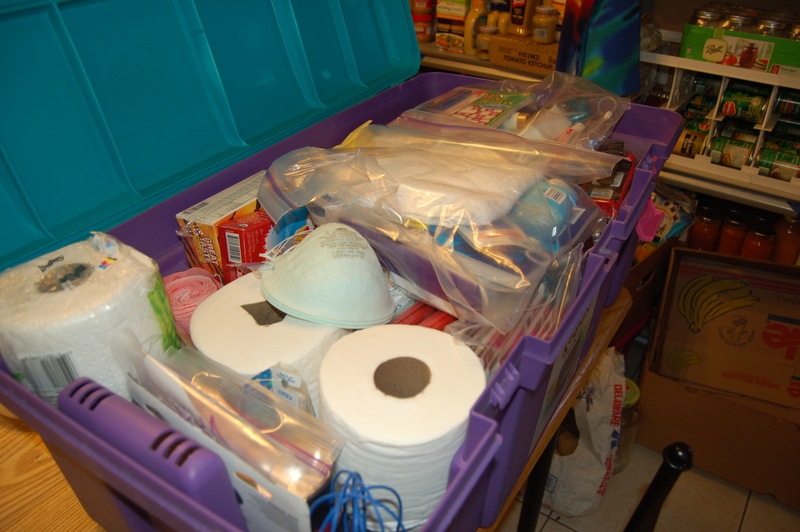 I was raised Mormon, and one of the main tenets of the church is preparedness–self-reliance, being as prepared as possible in the event of an emergency, food storage, etc. One of the things that church leaders encourage members to have is a 72 hour kit for their families. Have you heard of a 72 hour kit? Perhaps you know them by another name–Go Bags, Bug Out Bags, etc–but, in simple terms, what they are is a portable kit of supplies that will sustain your family and fulfill your basic needs for three days in the event of a crisis. I feel like the television show Doomsday Preppers has given this concept a bad name. No one is suggesting that you must prepare for nuclear war, or massive economic collapse, or an apocalypse scenario–not at all. And let’s face it, if something like that happens, very few families, even those who are die-hard preppers, are truly going to make it. It is the unfortunate truth. You simply cannot be prepared for every possibility. However, a 72 hour kit IS something that every family can use. It is not for extremists, or something that only fear-mongers own. This is something that FEMA and the American Red Cross are recommending for families just like yours. I too was cynical for a long time. I was one of those who believed that nothing would happen to me that would hinder my ability to get help or food. But, we moved out into the country, and into an area where we are often snowbound for days at a time, and we also are prone to losing power, and that can take a long time to be restored. It only took one lengthy power outage, no candles or flashlights, no non-perishable foods, and no heat source before I started wondering whether we might want to consider making emergency preparedness a priority. And, for us, a 72 hour kit seemed the most logical way to start. However, if you’re anything like I am, the idea of gathering enough food and supplies for each member of your household for three days can seem so overwhelming–it still does to me sometimes! So, I am going to share with you the process we used to get started, and I will show you some of our weaker areas and ways we can improve, so you can learn from our experience. First, look online, or in reliable preparedness books and magazines, like Survival Mom: How to Prepare Your Family for Everyday Disasters and Worst-Case Scenarios , until you find a list that you feel you can work with and that suits your family’s needs. A bit of a warning–you will NEVER find one single list that will cover everything that you will need. Start with one, and grow from it. I modified this one, personally. Feel free to use whatever list you want, though I recommend looking through several before you choose one to start with. I was very overwhelmed in the beginning, between the number of items needed and the money I felt I would have to spend. I decided to “shop” in my own home to find items like toiletries, paper goods, old pots and pans, items like flashlights and a compass, etc. Honestly, I think I found about 1/4, or maybe even 1/3 of our items simply by going through our house! 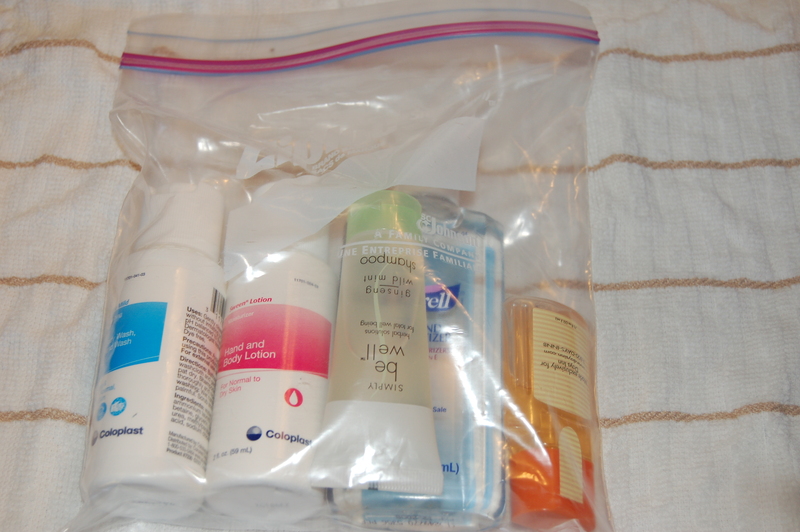 We threw in items like hotel sized shampoos and soaps we picked up during our travels, samples we received from the dentist, a roll of paper towels, a couple rolls of toilet paper, some granola bars. We had so many items already, and we didn’t even know it! You will add items to your kit a bit at a time, and over time, you’ll discover you might need more of this and less of that, and some new essential might need to be considered. Plus, you will need to consider the needs of your pets, stockpiling medications (we are just dreadful at this), portable water and filtration needs (another one of our weak areas), and copies of important documents (we still need this, too). We recently did an inventory of our kit, and I wanted to share it with you, and how we obtained some of our items, where we still need to improve, and tricks to getting items for free or for only a few dollars. This is our 72 hour kit. In addition to this tote bin, we have portable 2 liters of water (nowhere near enough), a case of MREs, and two buckets of emergency food that will feed all four of us for a total of 8 days. 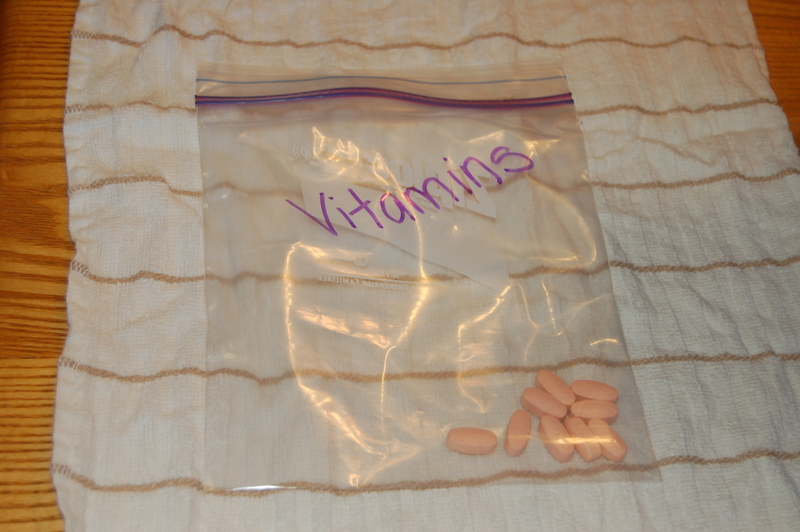 Vitamins are a great source of extra nutrients, and they are very portable. I’d like to add 24 more to this bag, give or take, just in case. We have dust masks in our kit, just in case we need to shield our airway from allergens, germs, etc. I can’t even begin to tell you the amount of toothpaste in our kit. I don’t know how it happened, but we ended up with about 8 sample sized toothpastes in our kit. Toothbrushes and toothpaste are a great way to feel clean and at home even in the midst of chaos. 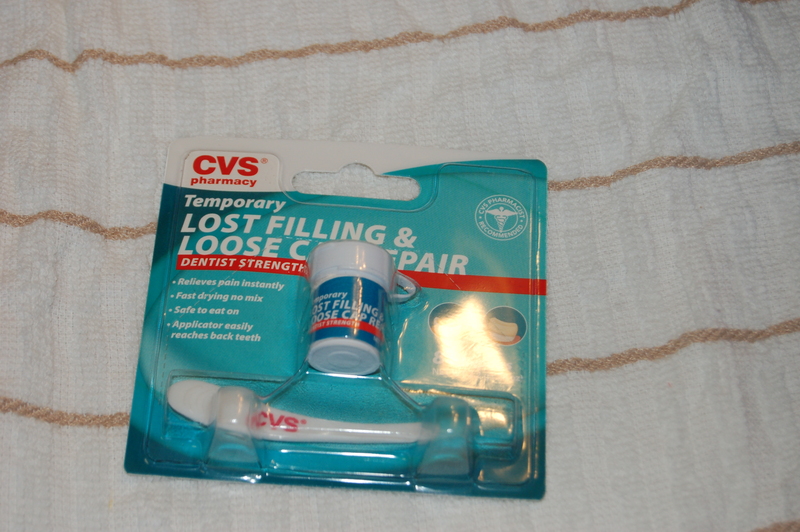 Save those samples the dentist gives you during checkups–they are great for a kit! Yes, I need my toilet paper. 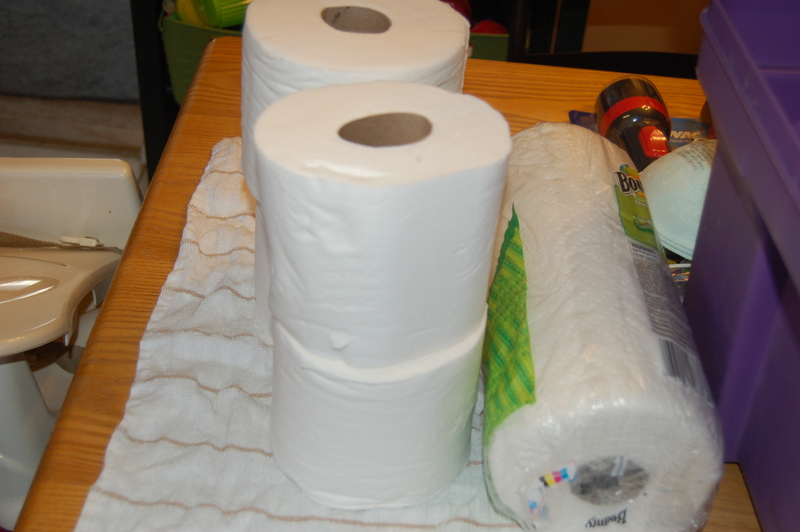 And a roll of paper towels can never hurt in the event you need to do a quick clean up. See what I mean about our soaps coming from samples we received in various travels? We even have samples from a stay in the hospital–they just throw out what you don’t use, and they were happy to let us take them home. The dollar store is another resource for trial sized products. 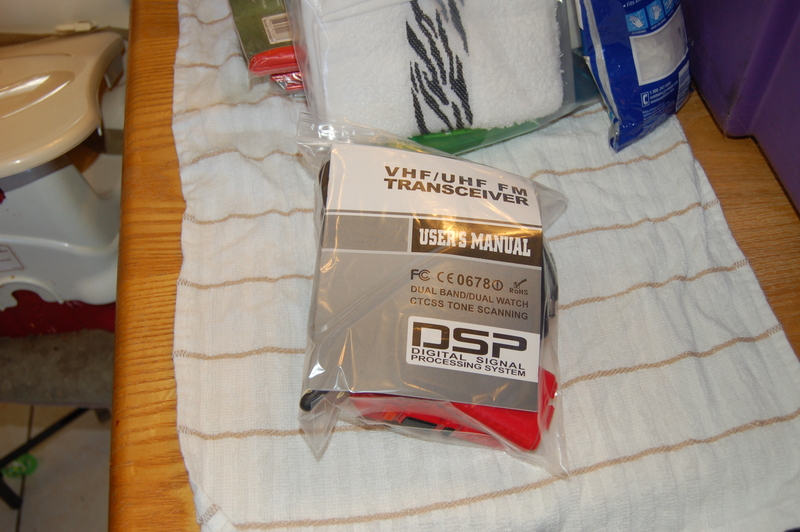 We also keep deodorant and razors in our kit–perhaps more for comfort, but it makes me feel better to have them. We have Motrin and Tylenol, for both adults and children. 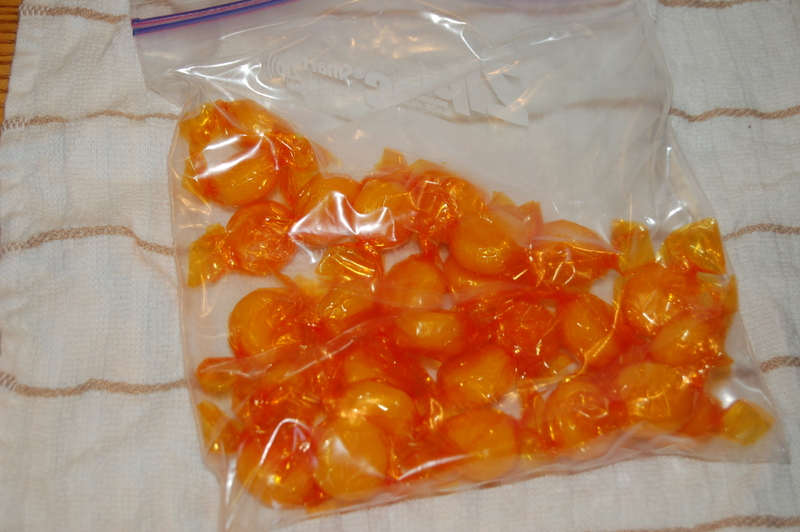 Hard candies are a great way to keep your blood sugar regulated, and it’s nice for the little ones to have as a treat. This is one of my favorite items in our kit. My husband and I both have extensive dental work in our mouths, so this is an absolute must. And the best part is that we found it for $2 on a clearance rack at CVS! 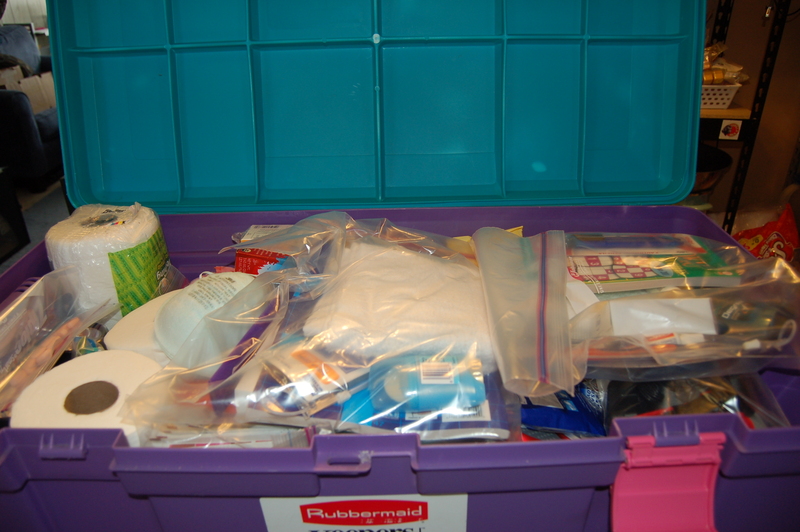 Clearance sales and overstock bins are a great way to find unique items for your kits. 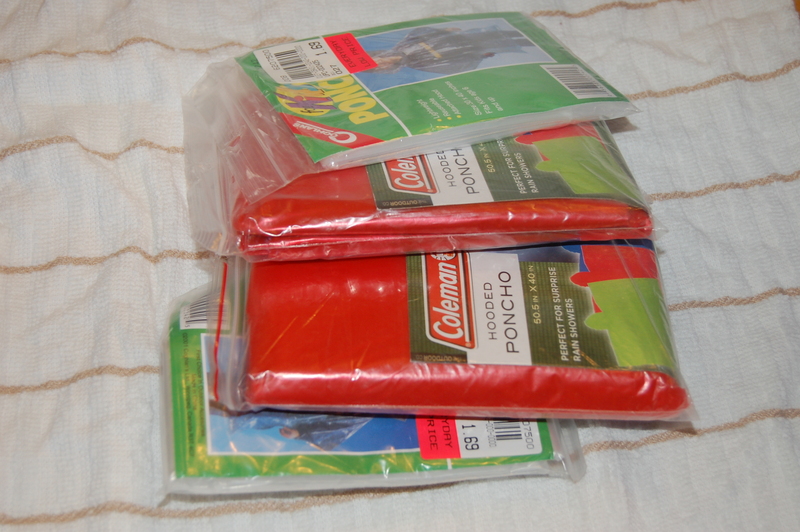 Ponchos are a great way to protect yourself from the elements, yet it still fits inside of a kit. We also have 4 space blankets for the very same reason. These only cost a few dollars a piece, and they can provide protection from inclement weather. Disposable gloves are useful items to keep in case you must deal with dirty materials or cleaning. If you have a baby in the home, remember to include diapers, wipes, bottles, pacifiers, formula (if using), and anything the baby might need. Our youngest is two, but we still have diapers and wipes in our kit, plus a Binky for comfort. Cocoa packets will make for a nice, warm comfort food that fits easily within a bag or bin. 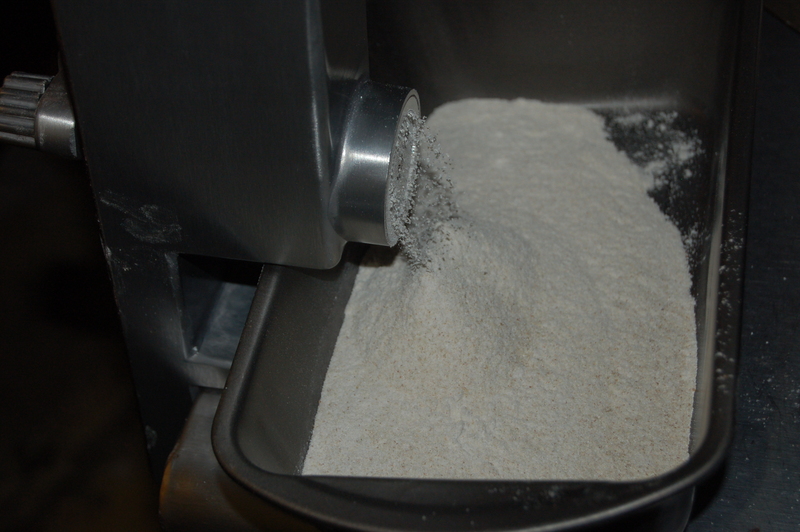 Soup mix is also a possibility for the same reasons. We have both in ours, plus the pans and mugs for cooking and consuming. (Consider a small portable party grill for cooking food.) 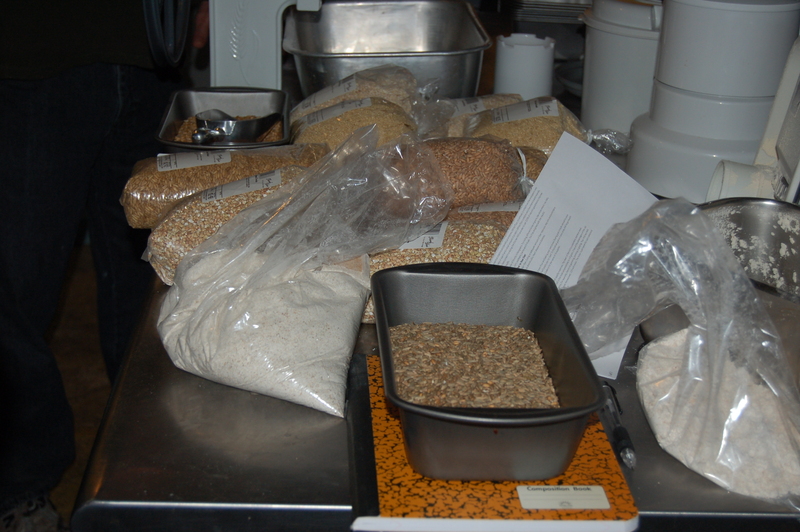 We also keep oatmeal in our kit because it is hearty and something soothing. Trash bags are great to have for any litter (you don’t have to be a litterbug, even in an emergency). We have a first aid kit, some animal first aid materials like bandages, and also bug spray. All of these will come in handy when safeguarding the health of your family. Ladies, make sure you keep feminine hygiene items in your kits–just in case. 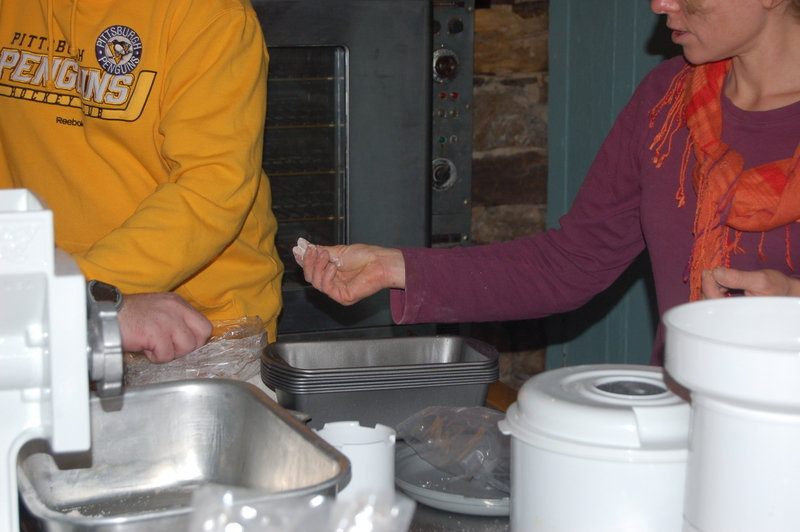 We keep hand warmers in the event of cold weather. These are very inexpensive. If you kept a compass from scouting days, throw it in your kid for navigational purposes. This is not a comprehensive 72 hour kit list, but it gives you an idea of what we have, and hopefully, you find some useful information and are motivated to create a bag for your family! So, I’m going to get a bit personal here…. Money is tight right now, due to a few reasons (temporary ones, thank heaven). We’re in the hole right now; our checking account is overdrafted. And we’ll be in the black for a few days, and then back to red after that. I am trying to remind myself this is temporary, that my husband is lucky enough to be employed, and that I will find a successful means of income (a part time job I had lined up didn’t work out). I’m trying to remember to be grateful. But it can be hard, you know? And that was a comfort to me, albeit a small one. So, for two weeks, we will be tracking each and every penny, and spending our dollars very deliberately. We will be menu planning, budgeting our food and gasoline in CASH as not to spend more than allotted. We will be doing an inventory of our food, so we know what we have to work with, and what can be cut out of the grocery list. We will be examining wants vs. needs. We will be repeating, over and over again, this is temporary, and this is not a trial–this is a challenge, and one we accepted years ago via preparations. We can do it. We will learn from this, and we will use it as a means to start cracking down on our budgeting and spending habits. My fellow mid-Atlantic peeps will remember last summer’s derecho–a very powerful wind/thunder storm–that did a lot of physical damage on the ground in our region. In my own area, for example, our neighbor’s trampoline became “unstaked” from the ground, was picked up by the wind, sent down the hill over our car, and into the yard across the street. In addition to the fact that the neighbor initially said, “Well, how do you know it is OUR trampoline?” (um, we have eyesight? ), we had almost two thousand dollars worth of damage to the roof and door of our vehicle. Sometimes, you simply cannot be prepared. The neighbors, in their defense, had the trampoline staked into the ground with these massive metal stakes that ultimately damaged the paint on our car. 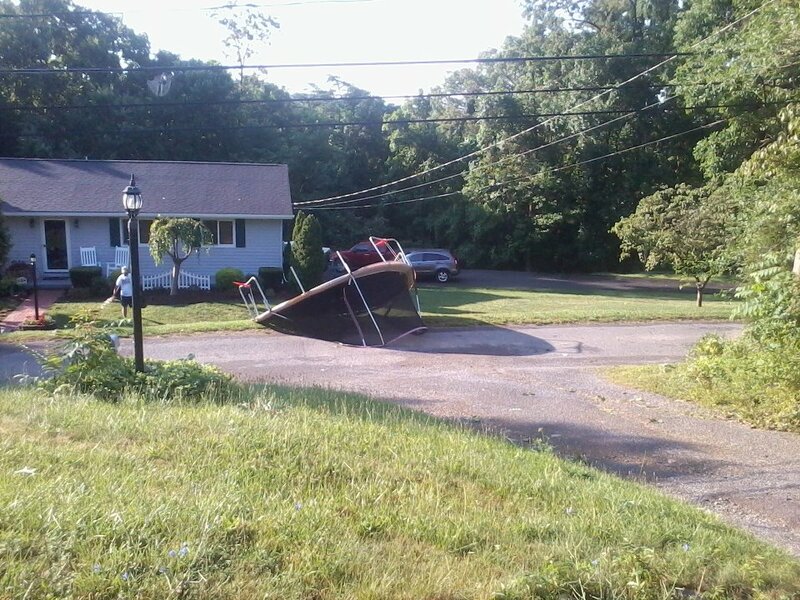 Normally, even a severe thunderstorm wouldn’t uproot a trampoline that size and with those precautions. But, there are things we can do ahead of time. I consider myself a fledgling “prepper”–we’re not talking Doomsday Preppers here–but I am referring to doing what we can ahead of the storm. We had insurance that covered the damage to our car at 100% without invoking the neighbors’ policy. We can move things like grills and trash cans inside ahead of a predicted storm, when possible. 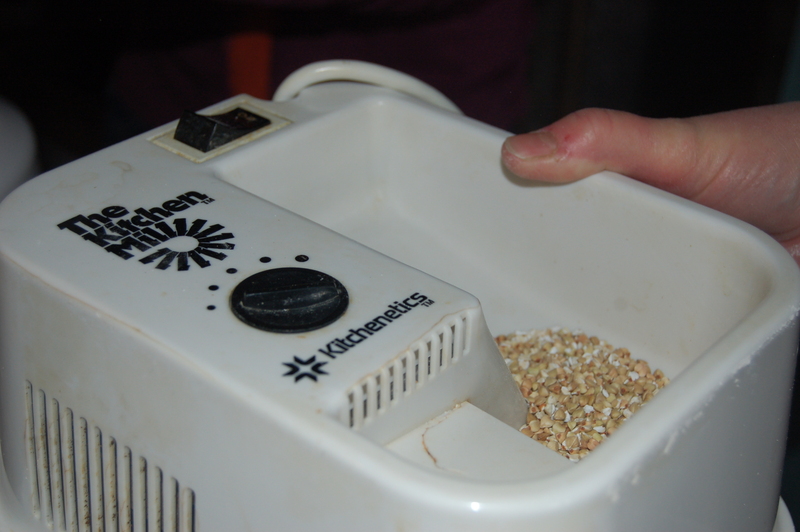 We can find ways to keep heat and food in our homes during emergencies–maybe by having three days’ supply of goods, or a generator. We can buy inexpensive weather radios to be able to listen for updates from emergency management agencies. There are small, cheap things we all can do to not necessarily avoid an emergency, but to minimize its effects. Meteorologists are calling for another potential derecho today, in fact, and I urge all of you (not just in the line of fire) to think about what you and your family can do to make things easier on yourselves in the event of a minor emergency. if you are in the region of the projected storm, do what you can NOW. The little steps can save you some big hassles in the long run.